Beautiful pink cherry tree in the forest. Digital illustration. Watercolor hand painted cherry flowers wreath pattern. Botanical illustration in vintage style. The bark of the tree is black. Cute unicorn in the magic forest. 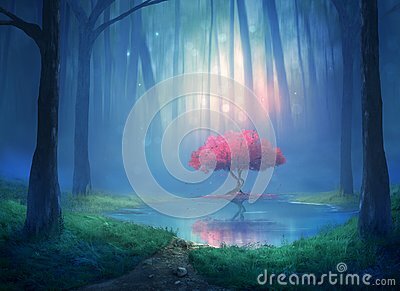 Set of different trees, bushes, grasses, leaves, mushrooms, apples, berries and clouds. Vector illustration.